Using the same principle as our Ram Driven Mechanical Scrap Chopper, this pneumatically powered chopper is designed to shear scrap material from .004" (0.1mm) to .074" (1.8mm) thick mild steel. 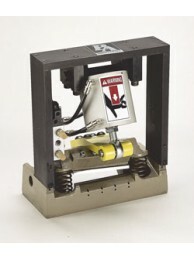 Provides controlled chopping while integral dampeners absorb snap through shock. The helically ground upper blade, made of high chrome tool steel, shears nearly any kind of material. Note: Solenoid Voltage is 120 VAC, Single Phase, 50/60 Hz. Other Voltages available - 240 VAC, 24 VDC. ASC-6 AIR SCRAP CHOPPER Using the same principle as our Ram Driven Mechanical Scrap Chopper, this..
ASC-9 AIR SCRAP CHOPPER Using the same principle as our Ram Driven Mechanical Scrap Chopper, this..
ASC-12 AIR SCRAP CHOPPER Using the same principle as our Ram Driven Mechanical Scrap Chopper, thi..